The easiest way to buy cryptocurrencies is to join an exchange, link a bank account, then make a purchase. Unfortunately, many popular exchanges offering this feature are lacking in other areas. You can buy bitcoin or ethereum with a credit card, but not much else. The best way around this limitation is to buy cryptocurrencies on one exchange, then transfer the funds to another service. Coinbase and Binance are prime candidates for this type of exchange. The fastest and simplest way to buy a variety of cryptocurrencies is to fund a Coinbase account, transfer those funds to Binance, then start trading. Even if you’ve never purchased a cryptocurrency before, our guide below will walk you through the entire process, step by step. Why Transfer from Coinbase to Binance? Coinbase is one of the best-known exchanges in the world. Its key feature is the ability to connect fiat (hard currency like U.S. dollars) to cryptocurrencies. By linking a credit card or bank account to Coinbase, you can transform funds into Bitcoin, Bitcoin Cash, Ethereum, Ethereum Classic, or Litecoin. Coinbase isn’t a one-stop shop for everyone’s trading needs, however. The service is known for high fees and a distinct lack of trading pairs. If you want to purchase a cryptocurrency other than BTC or ETH, you’ll want to transfer funds out of Coinbase to a more powerful exchange as soon as possible. Binance is the world’s largest cryptocurrency exchange by volume, transacting nearly $1 billion on a daily basis. It offers trading pairs with hundreds of cryptocurrencies, powerful buying and selling features, and incredibly low fees compared to Coinbase. If you’re looking to make your first cryptocurrency trades, funding a Coinbase account and transferring to Binance is definitely the way to go. The most time-consuming part of the Coinbase to Binance transfer is getting accounts with both exchanges set up and verified. The first 2 steps below will walk you through this process. If you already have active accounts with both exchanges, skip to Step 3 to start the transfer. Go to the Coinbase home page and click the “Sign Up” button at the top right. 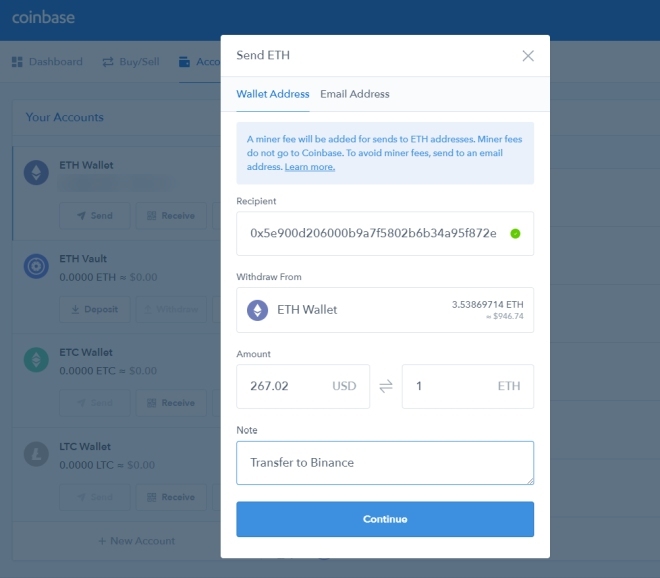 Fill in your personal details, including a valid e-mail address, then click “Create Account.” Coinbase will send a verification email with a link you’ll need to click to continue the sign-up process. Once email validation is complete, go to your Coinbase account and choose to create an Individual account. Next, add a phone number, then choose a payment method. Bank accounts are recommended over debit cards, as Coinbase’s fees are much lower for this type of transaction. After selecting “Bank Account,” Coinbase will prompt you to provide verification details for your ID. This is the KYC (Know Your Customer) process, and it’s a common practice for most cryptocurrency exchanges. Gather the required documents and upload them to Coinbase. Next you’ll be prompted to enter account details for your bank. Add the relevant information and Coinbase will send 2 test transactions to that account, each just a few cents. Once those appear on your statement, you’ll need to go back to Coinbase and enter the amounts to confirm you own the account. 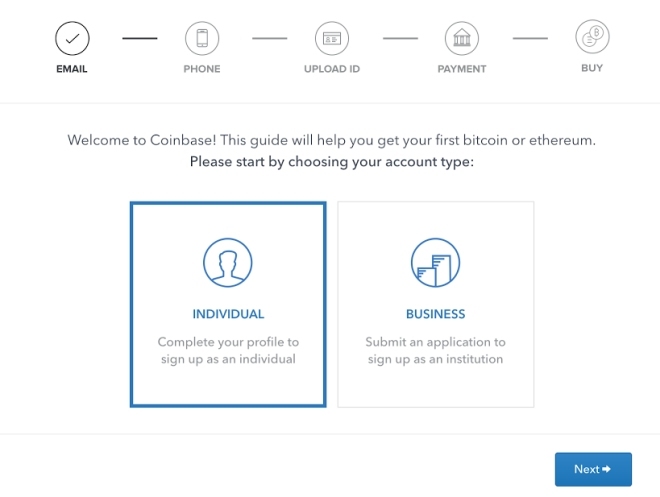 Once you’ve completed these steps, your Coinbase account will be set up. It may take a few days for the bank account transactions to complete, but apart from that you’re ready to go..
Before you can send funds to Binance, you’ll need an active account. This will be faster and simpler than setting up the Coinbase account, as there’s no bank information to share or validate. Start by going to the Binance registration page. Enter a valid e-mail address, followed by a password. Binance will send an email to you for verification. Click the link inside and your account will be activated. Log into Binance using your email and password. Read and accept the safety risk notices and click “Continue”. Next, you’ll want to set up 2-factor authentication either using the Google Authentication app or SMS Authentication. You can skip this step, but we strongly suggest you choose a method and use it for added security. 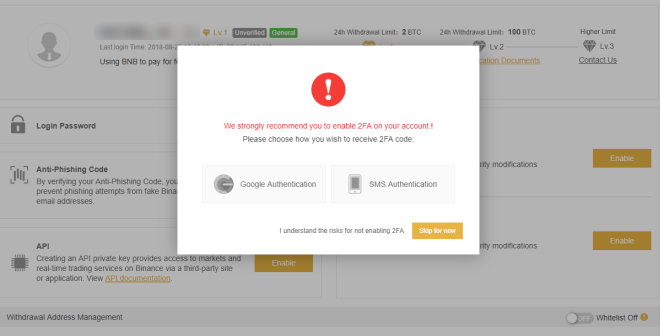 After 2FA is complete, your account is ready. There is an initial withdrawal limit of 2 BTC per day, which you can raise by submitting KYC documents under your Account page. Need more help setting up a Binance account? Check out our full beginner’s guide to using Binance. Once you’ve got both Coinbase and Binance accounts set up, you can finally begin the transfer process. The first thing you’ll need to do is add funds to Coinbase via bank account transfer. You can also use a debit card or wire transfer to fund your Coinbase wallet, but they carry higher fees and aren’t recommended. Start by logging into your Coinbase account and clicking on the “Buy/Sell” tab at the top. You’ll see a selection of cryptocurrencies outlined in light gray. 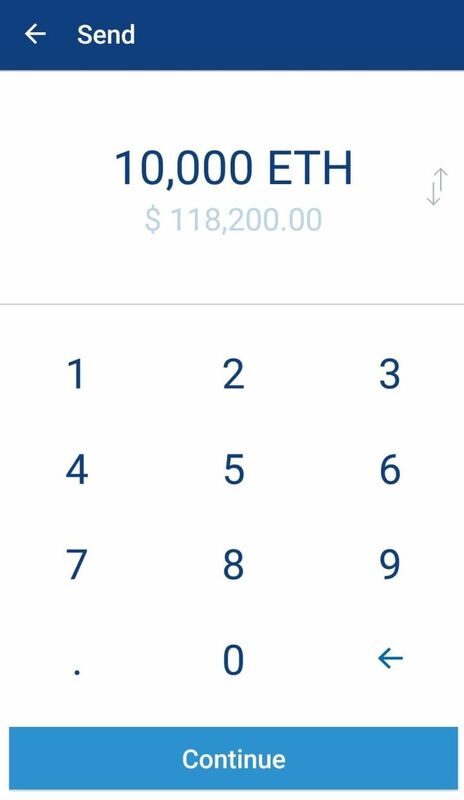 Choose the one you want to buy (BTC or ETH, most likely), then select a payment method from the dropdown box below. The bank account you added during setup should show up by default here. Now choose an amount you want to transfer by entering an amount in USD on the left. Coinbase will automatically convert this to your chosen cryptocurrency. You can see a breakdown of the transaction on the right, complete with the included Coinbase fee. If everything looks good, click the blue “Buy” button at the bottom. 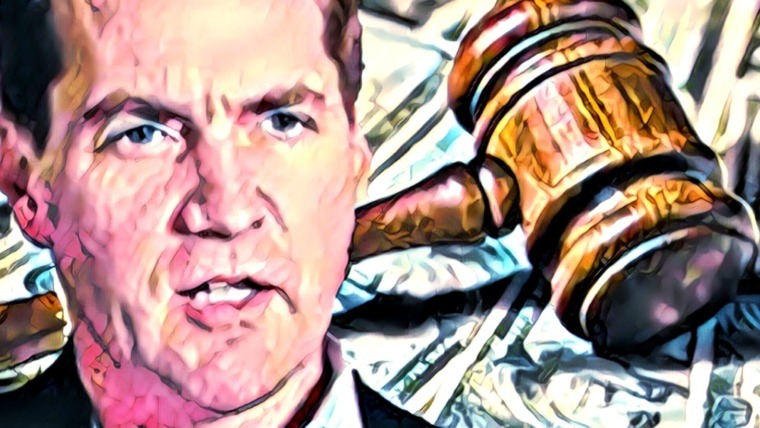 Coinbase will then start the process of withdrawing the fiat funds from your bank account. 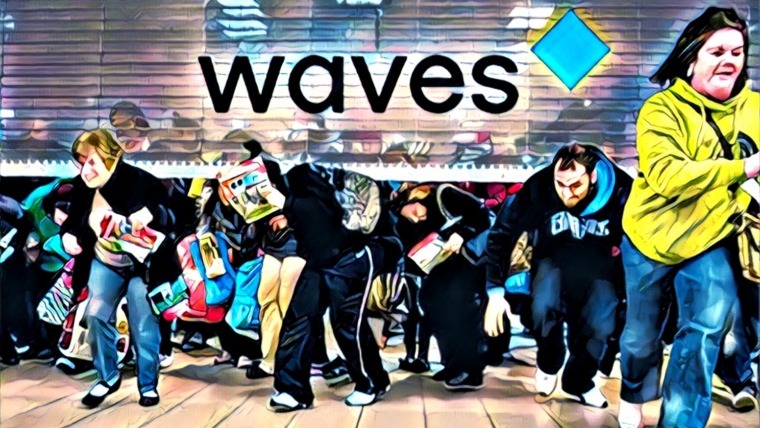 Your cryptocurrency purchase will take several days to appear in your wallet, so be patient. Transferring funds from Coinbase to Binance is as straightforward as any cryptocurrency transfer. You already have the accounts and cash in the right place, all that’s left is to send coins from one wallet to another. First, we’ll need to visit Binance and copy our receiving address. 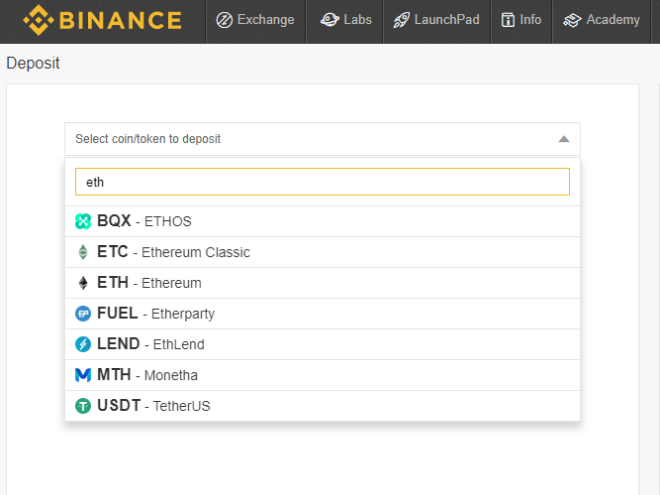 Log into the site and choose “Deposits” from the “Funds” menu at the top of the screen. On the left, you’ll see a dropdown menu that says “Select coin/token to deposit.” Type the name of the coin you want to receive, then click its entry. Binance will generate a wallet address for the coin of your choosing. Copy the address to your clipboard. Make sure you copy the whole thing, and make sure you only send this type of cryptocurrency to the address, otherwise you’ll lose your deposit. Now go to Coinbase and click the “Accounts” tab at the top of the screen. Scroll down to the cryptocurrency you want to send to Binance. Click the “Send” button, the one with the little paper airplane on the side. Coinbase will open a small window with the transfer information ready to go. Paste the wallet address from Binance into the “Recipient” box near the top. A green circle will let you know it’s valid. Next, choose the amount you want to transfer out of your Coinbase account using the bottom left box. 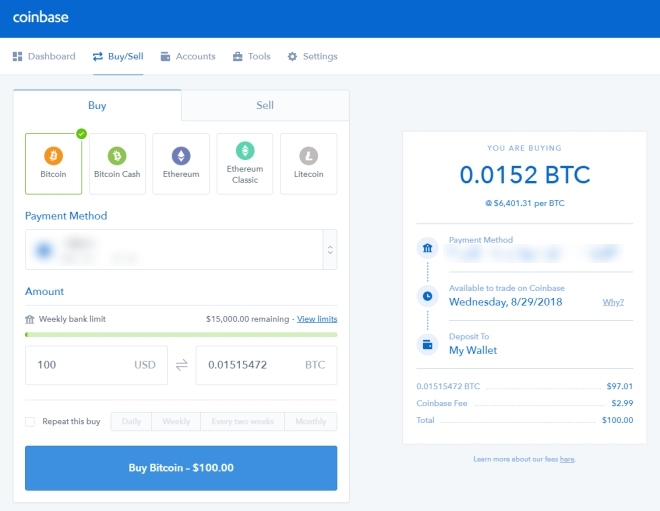 You can enter the amount in USD or in the cryptocurrency itself, and Coinbase will show you the conversion. Finally, put a small note on the bottom of the transfer, just so you know what your funds are doing. Enter something like “Transfer to Binance,” then click the “Continue” button to start the process. Unlike fiat transfers, cryptocurrencies generally resolve transactions in seconds or minutes. This can vary depending on the network speed associated with your chosen crypto. Coinbase will end you a confirmation email to let you know the transfer is taking place. Once it’s complete, head over to Binance and click “Funds > Transaction History.” You should see your Coinbase transfer here, along with the transferred amount sitting in your Binance wallet, ready to trade. If you need help making your first trade on Binance, our How to Use Binance article provides a step-by-step guide! Not every cryptocurrency exchange has a mobile app. 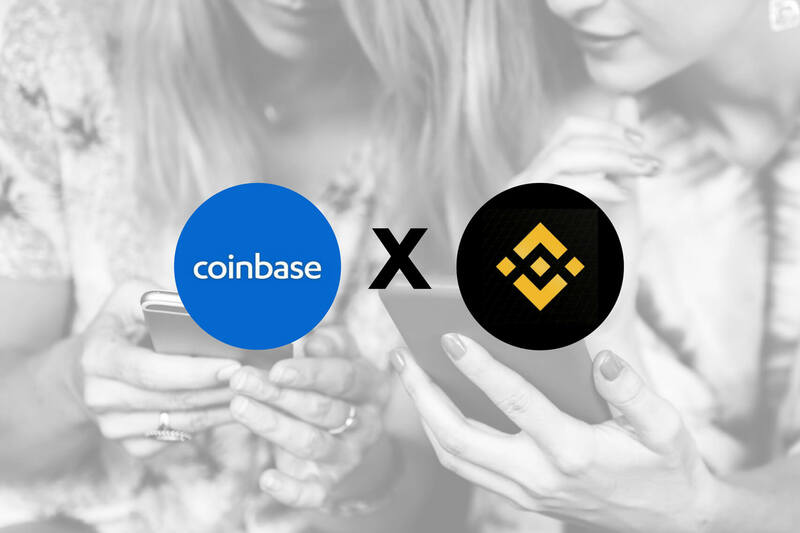 Both Coinbase and Binance do, though, and they provide most of the functionality from the desktop interface in a portable, touch-friendly form. You can transfer funds from Coinbase to Binance on your iOS or Android device in much the same way as outlined above. Make sure you have your accounts created and verified on both Coinbase and Binance, then download and sign into each of the apps on your phone. Open the Binance app and log in. Tap the “Funds” icon at the bottom of the screen, then the “Deposit” label at the top. Select the coin you want to deposit from the menu on the next screen. The app will generate a wallet address on the spot. Tap “Copy Address” to store it on your device’s clipboard. Next, open the Coinbase app and sign in. Tap “Accounts” at the bottom, followed by the cryptocurrency you want to send to Binance. Tap the small paper airplane icon at the top right corner of the screen to open the “Send” dialog. Coinbase will initiate the transfer right away. Again, depending on the network associated with the cryptocurrency you sent, it could take a few seconds or a few minutes for the transaction to verify. Once it does, check your Binance app’s “Funds” tab to see the amounts added to your wallet. Coinbase is known for its high fees. The exact amount varies depending on funding method, action, and country of origin, but most users can expect to pay 1-3% when they deposit funds into Coinbase or withdraw into a bank account. By comparison, Binance charges 0.1% for crypto-to-crypto transactions, and it offers the ability to lower those fees by holding BNB tokens in your account. You can’t link a bank account to Binance, of course, but this enormous disparity in cost is one of the reasons why so many people transfer funds from Coinbase to Binance. An easy way to dodge some of these deposit and withdrawal fees is to move your funds from Coinbase to Coinbase Pro (formerly Gdax). When you create a Coinbase account, you automatically gain access to Pro and funds can be swapped between the two with ease. If you’re just getting into cryptocurrencies, know that the Coinbase to Coinbase Pro transfer process is a little complicated. Coinbase Pro is designed for experienced traders, after all. If you are eager to save on fees and want to give it a go, try this guide on transferring from Coinbase to Coinbase Pro. The next biggest way to save on fees when dealing with Coinbase is to use a bank account instead of a credit card. Coinbase charges 1.5% to transfer fiat from a bank to your Coinbase account. Using a credit card is faster, but it’ll cost you 4%. Unless you’re in a hurry, stick with bank accounts instead. Once you have a cryptocurrency or two in your Binance account, you’re ready to participate in the market. Investing isn’t an easy affair, especially in the highly volatile digital currency market. Before you trample off and lose your funds, take a look at the tips below for maximum investment safety. 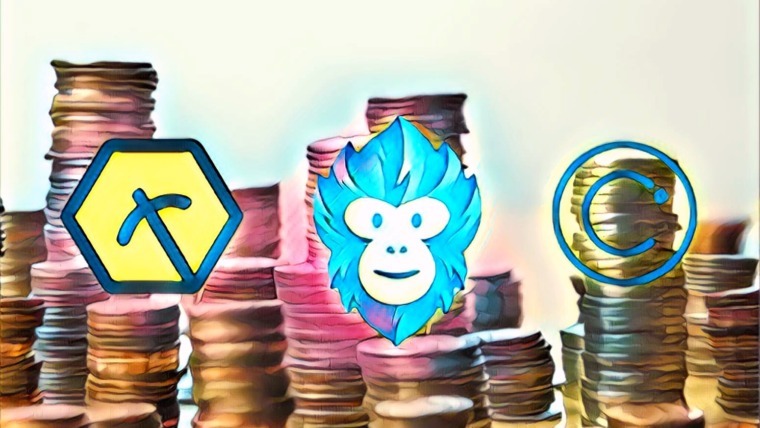 If you’re brand new to the world of crypto investing, a great place to get started is our article Investing in Cryptocurrency: A Beginner’s Guide. It covers all the basic strategies you’ll need, including advice on how to manage your own excitement. Early in your trading career, be sure to make your first transfers small. You don’t want to risk losing more than a few USD if you make a mistake. Once you’re familiar with how things work, you can slowly increase the amounts you transfer. Creating an active cryptocurrency portfolio is a long and intensive process. If you’re just starting out, hold this piece of advice in mind: keep it simple. Don’t buy a dozen cryptocurrencies and spread your investments thin. Pick 2-3 coins you’re familiar with, and only expand once you’re comfortable and well-informed. Speaking of well-informed, have you done enough research for that new coin you’re interested in? Chances are you haven’t. Start with this due diligence checklist, then keep researching until you’re an expert. And finally, are you interested in day trading cryptocurrencies? You might want to think twice before jumping in. 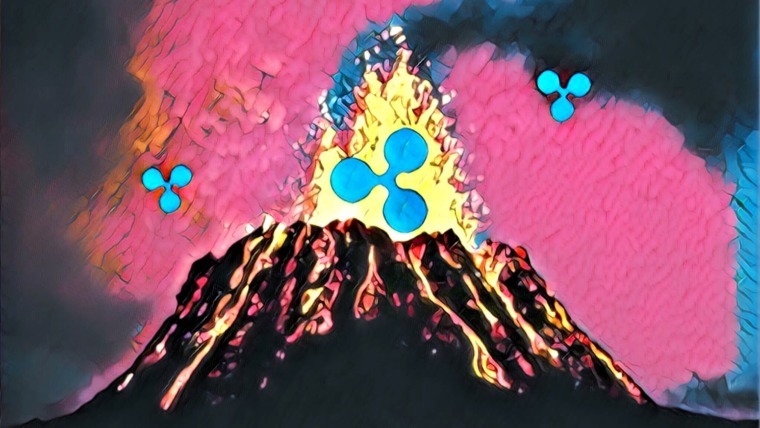 Hit up our How to Day Trade Cryptocurrencies article for the full scoop. Transferring cryptocurrencies from Coinbase to Binance isn’t as complicated as it seems. Once you complete the initial setup procedures, the rest is a simple matter of moving funds from one wallet to another. The best piece of advice for any beginning cryptocurrency trader is to take it slow. Once you see how easy it is to buy coins, you’ll be tempted to grab them by the fistful. Stay calm, do your research, and remember this is real money you’re dealing with. Patience is everything when it comes to cryptocurrency investing.